The death toll in an earthquake on the Indonesian island of Lombok rose to 387, authorities said on saturday. It added that hundreds of thousands of displaced people were still short of clean water, food and medicine after series of quakes hit Indonesia. The 6.9-magnitude quake on Sunday leveled tens of thousands of homes and mosques across Lombok, a week after another tremor surged through Lombok, killing 17. The National Disaster Agency spokesman Sutopo Purwo Nugroho said the death toll is likely to continue growing. “It’s predicted the death toll will continue to grow because there are still victims who are suspected of being buried by landslides, and there are victims that have not been recorded and reported to posts,” he said. 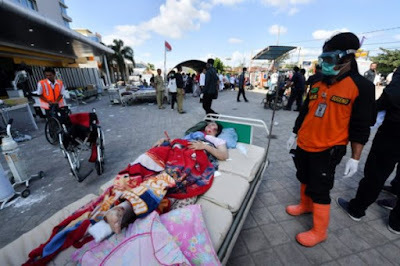 Around 13,000 people have been injured in the quakes and the number forced from their homes in the disaster has soared to 387,000, Nugroho said, with around 13,000 injured. The hardest hit region of Lombok has been the north, where 334 people have died and nearly 200,000 have been forced from their homes, according to the latest official tolls. Two people were also killed by the quake on the neighboring tourist island of Bali.